Here's a tip from our guest expert Wendy Nan Rees on how to help your dog beat the heat. I have often wondered why people want to take their dogs along for a car ride on a hot summer day. Yes, I too do not like to leave my three boys at home, but I also know the tragedies that can happen by leaving your dog in a hot car. 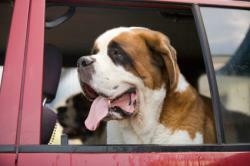 Some states have even passed laws about leaving children and pets in a car on hot days. Dogs have an extra challenge, because they don't sweat the same way we do. We have sweat glands all over our bodies. Dogs are only able to sweat from the pads of their feet and their noses. The main way they cool off is by panting. The interior temperature of a car can rise to above 110 degrees F in just a short amount of time. For example, if it is 70 degrees outside, the heat inside of a car can reach temperatures of more than 100 degrees in 15 minutes. When an animal is panting in very hot air, it only accelerates heat stroke. In Colorado, the city of Boulder is cracking down on pet owners who leave their pets inside a hot car after a Bulldog recently died from heat exhaustion. The owner was ticketed and charged with a criminal offense. Senate Bill 1806, signed into law on January 1, 2007 and sponsored by Senator Liz Figueroa (D-Fremont) is a new anti-cruelty law. The law states no animal may be left unattended in a vehicle under conditions that "endanger the health or well-being of an animal due to heat, cold, lack of adequate ventilation, lack of food, or water, or other circumstances that could reasonably be expected to cause suffering, disability, or death to the animal." Pet owners in California, in violation of this new law, may face high fines, jail time or both. If your dog spends time outside in a kennel, kennel covers are a must in order to provide shade. Also make sure plenty of water is available. You can purchase a pet fountain that supplies a continuous supply of fresh water. Stagnant water can harbor mosquito larva. Be especially sensitive to senior or overweight pets, short-muzzled dogs and pets with heart or lung disease. A big no-no: don't shave your pet thinking this will keep him cooler. In some breeds, the fur actually insulates the dog from the hot rays of the sun. If your pet shows any of these signs, here are some things you can do immediately to cool him down. Place rubbing alcohol only on your pet's paws. Place your pet in a cool, not ice-cold bathtub. Use a hose and wet your pet down, then let the water run under his belly. This will help cool him faster. Apply ice packs only to head, neck and chest. It is better to keep your dog from drinking a lot of water right away, since this is likely to induce vomiting. Instead, offer ice cubes to control the amount of water intake. Call your vet immediately and take him to the office. In times of emergency, such as a case of heat stroke or overheating, our pets truly count on us to be their advocate and caretaker. Remember, your pets are not just your animals; they are your friends.